Two months have passed since we saw the release of Launch Center Pro 2.0. That was a major update that brought the ability to share and import custom actions, new Dropbox actions and tags, photo attachments, prompt labels and externally launch actions. Today, the team at Contrast releases another big update to the app. The new update contains a lot of refactoring in terms of URL scheme syntax, refinements to the photo attachment features, several new tags, and integration with Fleksy. After spending a few days using the beta version, here are eight completely new reasons why I love the new update. If you remember what kinds of URL Schemes are supported by Launch Center Pro 2.0, you'd probably need a cheat sheet to figure out each of them. Despite of their raw powers, the URL Schemes could definitely use some refactoring. The new update tries to normalise the different URLs into the same base URL, i.e. launch://. Here are a few examples comparing the old URL Scheme and the new normalised ones. As you can see from the examples above, it's now easier to figure out and remember how one URL Scheme differs from the others. And, since most of these URL Schemes support x-callback-url, it's now quite rewarding for you to create TextExpander snippets that can help you write launch://x-callback-url/ easily. If you have written a lot of actions that use the old URL Schemes, there's no need to worry because they're still supported in Launch Center Pro 2.1. For someone like me, it's going to be a while before I completely upgrade all my Launch Center Pro actions into the new URL Schemes. By the end of this post, you will see the benefits of moving to the new URL Schemes that should motivate you enough to upgrade your actions to the new syntax. The new attach=photo makes it possible to grab photo from multiple sources. If you pay attention to some of the examples above, you will see that there are some refinements to the way you can attach photos into Launch Center Pro actions. Instead of having to figure out the different syntax for adding photos from Camera Roll, Dropbox, or the clipboard; the new syntax makes it very intuitive. As you can see, everything now starts with attach=photo. The sub-argument that you put behind the colon (:) will determine the source of the photo. Launch Center Pro 2.1 even adds a few new sub-arguments that may help you harness more power and flexibility from your iPhone. attach=photo:frontcamera and attach=photo:selfie are essentially the same thing, whereas attach=photo:library allows you to access Photo Albums and Photo Stream, in addition to the Camera Roll offered by attach=photo:cameraroll. And if you want to defer the decision of which photo source you want to use at runtime, simply use attach:photo. Launch Center Pro will show a popup that lets you choose from some of the above options at runtime. As what you can expect from attaching photos, you can use &quality=&fullres=1 to tinker with the quality level and resolution that you want the photos to have. They have been working very well with last photo, Dropbox photo, and photo in your clipboard since Launch Center Pro 2.0. And now, these arguments also work with all the new attach=photo sub arguments, such as camera and library. Launch Center Pro 2.1 adds two new arguments for attaching photos to your actions: maxwidth and maxheight. Defining these arguments will automatically resize the photo to fit the constraints. As someone who always uploads screenshots from my iPads to Dropbox, and resizes them to fit a maximum size of 600x600 pixels before being embedded to the review posts on this site, I really love this new feature. It is now easier for me to upload these screenshots, resize, and rename them with a single tap from Launch Center Pro. Because most of the screenshots I take are from iPad apps, this feature makes a Launch Center Pro for iPad very desirable for me. Even though I can always install Launch Center Pro on my iPads, I'd love to have an app that's specifically designed for the iPad. Hence, I created this action to upload a screenshot from my Photo Stream on my iPhone into a particular folder in Dropbox with a specific size constraint. Open this link to automatically install this action on Launch Center Pro 2.1 on your iPhone. The new [prompt-return] tells Launch Center Pro to keep the formatting as is. Previously, I have written about the [prompt-list] tag that can be used to automatically convert a multi-line entry into a comma-separated list. While it solved a problem of text conversion without the need of another app, there wasn't a way for us to enter a multi-line text that we want to keep the formatting as is. Well, at least not until Launch Center Pro 2.1. The new version adds a new [prompt-return] tag which allows you to use a keyboard similar to [prompt-list] tag. But, instead of converting the multi-line entry into a comma-separated list, [prompt-return] will keep the formatting as is. This makes it perfect for typing body-type contents, such as the body of an email or the content of a tweet. As an example, I will update my previous Launch Center Pro action which uses labeled [prompt] as a user input facade for a more complex action in Drafts: creating a reminder to send an email to someone with a predefined subject and body. This action previously used [prompt:Email Body] to compose the email body. Now, it uses [prompt-return:Email Body] instead. The new [list] tag allows the user to select a value at runtime from a pre-defined list of values. The most popular way to create a popup on iOS that contains a list of pre-defined values (LoV) is by using TextExpander's popup snippet. On the other hand, there aren't many apps that have supported this feature. Drafts and Fantastical 2 are good examples for this. The new [list] tag in Launch Center Pro 2.1 makes creating an LoV popup possible for other apps to have access as well. The best use case for this is to remove existing groups of actions in Launch Center Pro that have similar URL Schemes with a few variants within them. My first example is a group of actions that I have to reuse completed reminders in Due's logbook. I have up to six different actions in Launch Center Pro that each correlates to a keyword-based query to Due's logbook. With the new [list] tag, it's now possible for me to combine them into a single Launch Center Pro action with an LoV popup to select the search keyword. As you can see from the example above, the new [list] tag also supports label. Each option is separated with the pipe (|) character. Using this approach, groups that contain similar actions can be streamlined into a single action instead. My second example demonstrates how the [list] tag also supports key=value syntax commonly found in LoV definitions. This allows you to see the keys in the popup, but use the mapped value for the selected key to proceed with your action. My example illustrates how I'm using the [list] tag to simplify the process of choosing a phone number that I'd use to contact my wife. Instead of tapping the small info icon on the Favorites tab of the built-in Phone.app, I find this action to be much faster. As a bonus, I can even put a comma (,) to dial in her office extension number within a single tap. The new actions still use the built-in Facebook/Twitter compose view from iOS. Using the new normalised URL Schemes, we can now utilise the great tags supported by Launch Center Pro 2.1 to repopulate the values before loading the built-in compose view. For example, you can create an action that would use a TextExpander snippet, the clipboard content, a link to a Dropbox file, or even a value from an LoV. And if the clipboard content is a photo, you can even upload two photos in a single post using the /clipboard?attach=photo action variants. Here's an example of an action that will prompt you to take a selfie, crop it to an Instagram standard of 612x612 pixels, before uploading it to Twitter alongside your very own caption text. 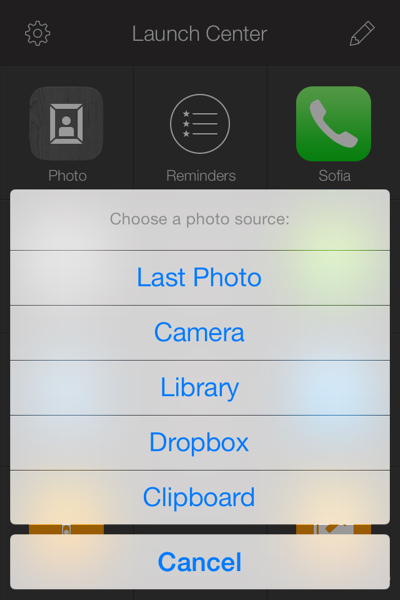 The save=no parameter in this action helps to avoid cluttering your Camera Roll with your selfies. The new sharesheet URL allows you to create actions that can trigger it to pop up. One of the new features in iOS 7 is the introduction of Airdrop and Assign to Contact features in its share sheet. The new version of Launch Center Pro enables us to trigger this share sheet with either a text, a photo, or using the clipboard content. Here's an example of an action that I create to quickly save an image from Dropbox to Camera Roll without loading the image nor its thumbnail. The action uses [list] tag to select one from my three most-frequent use cases, and the option to save the image will show up when the share sheet pops up. Unfortunately, launch://sharesheet doesn't support x-callback-url yet. Two other new features in Launch Center Pro 2.1 are the integration with Fleksy and the ability to disable auto-correction and capitalisation in [prompt] windows. To use the Fleksy keyboard, simply replace the basic [prompt] with either one of [prompt-fleksy], [prompt-fleksy-voice], [prompt-fleksy-list]. These prompts also support labels, and may require you to download the language pack that you want to use. The double-colon (::) characters can be use to signal Launch Center Pro to disable auto-correction and capitalisation when the user inputs text in the [prompt] window. To learn more about this feature and all the features I've discussed here, please read the official release notes of Launch Center Pro 2.1. Launch Center Pro 2.1 is a significant update to a great 2.0. The integration with Fleksy, a better photo attachment system, the refactoring of its URL Schemes, and the great new [list] tag seem to line up Launch Center Pro for a more advanced set of features. I can't wait to see what lies ahead on the product roadmap.